When is a cubby house not a cubby house? When it’s your bed, that’s when. Or is it? 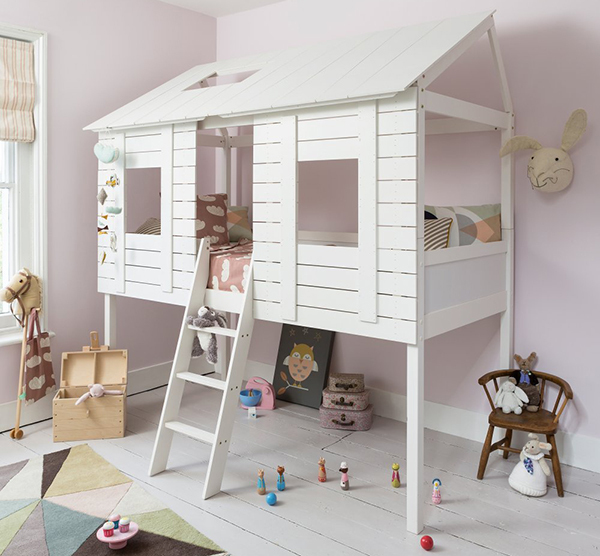 Whenever it is, you can be sure this tree-house style bed will be the best bedtime fun for your little one! From Noa & Nani, the Christopher Treehouse Bed is an incredible floor space (and sanity) saver. Built with a sturdy solid wood frame, it includes a fun fixed ladder to climb up and down. Cute cut out windows, open bed ends and a roof sky light allows plenty of light to filter through, leaving no excuses for not reading at night. Surely we can assume with a bed this fun, children will only to happily go to bed when asked and not want to leave it after being told goodnight, not even for another glass of water . Or to ask a question. Or to get out of bed for that very important reason of which they can no longer remember. Yes, I’ll keep my fingers crossed they’ll want to remain tucked up tight in this beauty – and frankly speaking, who wouldn’t? The Christopher Treehouse Bed is priced £399 and available direct from Noa & Nani, be sure to contact them for a shipping quote if you want to make this beautiful bed yours.